I'm in the running for AmazeCats Next Top Cat! You've probably been voting for lots of my friends over the past few days. They're in the competition too. Well MY voting day starts tomorrow so I'm rehearsing my AmazeCats Magic Act. 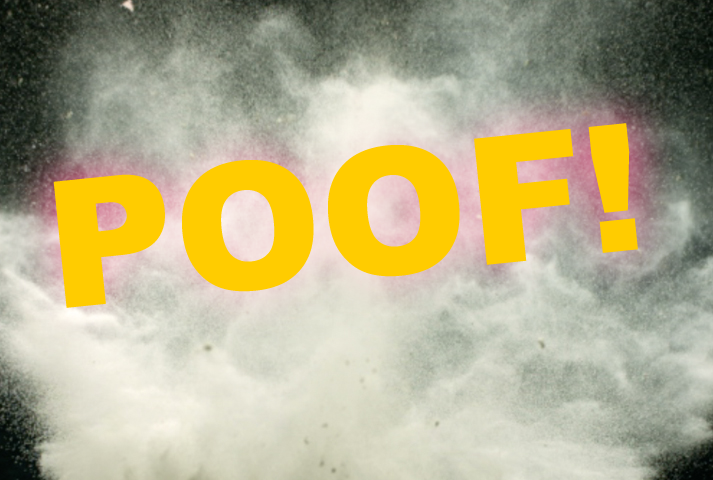 Glogirly says that even I was David Copperfield, I probably wouldn't win. I ought to be able to make him disappear too. AmazeCats 2nd Round - Vote for ALLIE Today until 2pm EST! Vote for my pink-loving pal, Allie today until 2pm EST! Cod knows that Maxwell and FaRADaY are no help. Maybe YOU can help her pull out a second place win. We can't let that pink mani-pedi go to waste! This sounds promising. I'm sending you Figaro. The UPS man has NO idea what he's in for. Definitely gotta go and vote for Allie today! Say, that's a pretty neat trick! I should learn it for when extraneous, irritating Humans (i.e., ALL of them) come around. Send me directions to this trick ASAP! MOL MOL MOL! Wow wish we could do that Katie. Pawsomw magic! Have a terrific Tuesday. 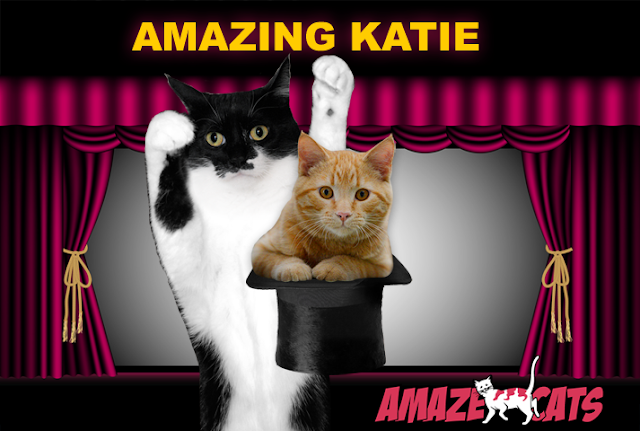 Katie, even your magic will not be able to make Binga and the dog disappear! I am afraid I am stuck! But I AM voting for you on Wednesday! And asking my fans to do the same. Well done you! Although if you had that power all along, why are you only disappearing him now?? Could it be you actually like that ball of orange fur? You're gonna get lots of cats in the mail! MOL! Good luck Katie! We'll vote fur you tomorrow. We know that magicians don't reveal their tricks, but could you share the instructions with Newton for this one? He promises only to use it on Ashton once. Good luck Katie, we are rooting for you. wow! love the smokes. hope you sent W2 over here so he and I can continue our stealthy maneuvers and pouncing techniques. In the meantimes, BEST OF LUCK wif the competition. Whoa...Katie! You did it! Now how long will that last?? Good luck in the contest! Good Luck Katie, we're runnin' over to vote. Oh yeah, um... mom wants to know what she's supposed to do with this extra orange cat dad found in his hat????? Go Katie! You look so excited! Yeah! - Crepes. Keep practicing Katie! We have a feeling he'll reappear again! Hmmmmmmmm, I do like hats ya know! Well it's about time you pulled THAT outta the hat! WooHoooooooo! Did you send W2 on an adventure in a different/parallel universe? I can't wait to read all about it. That sure is amazing Katie. That was good. Can you do it long distance to HHGutt? Can me send yous Kozmo? But then again, me thinks he still has a bit of a crush on yous and all the mooning might gets on your nerves even more than Waffles! Allie: yes, yes, we'll vote and all, but let's get to the IMPORTANT part. Did you make him disappear??? I'd give my best collar for a chance that might happen to Faraday. Truly I would. 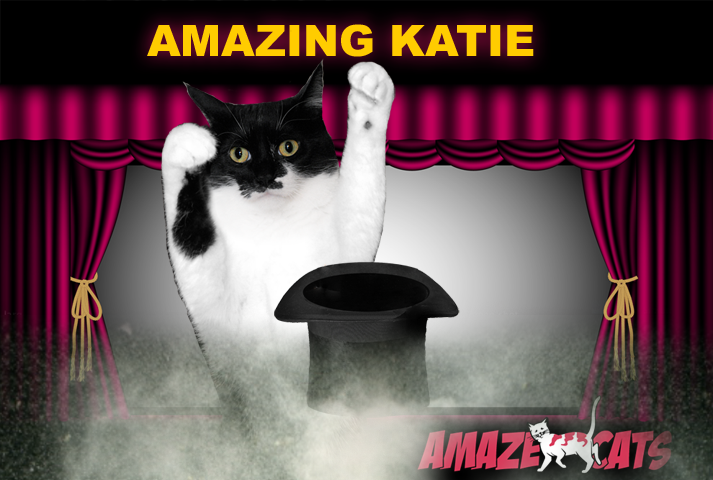 I´m not sure I´m so very impressed with that trick , Katie ? !